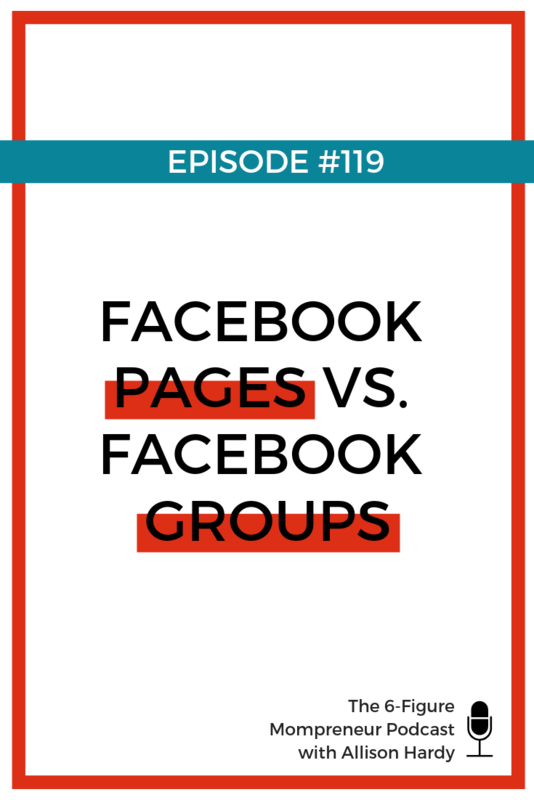 Listen to "Facebook Pages vs. Facebook Groups" on Spreaker. Are you ready to turn your Facebook Group into a lead generation machine? Join us for the FREE From Wallflowers to Groupies: the ULTIMATE Facebook Group Challenge! In today’s 6-Figure Mompreneur Podcast episode I want to chat about having a Facebook Page versus having a Facebook Group for your business. I want to weigh the pros and cons and chat through a few ideas because this is probably one of the biggest points of confusion for many online entrepreneurs! What’s the point of having both? And what should our expectations be with having both a Facebook Group and a Facebook Page? First and foremost, this is my theory with social media: it should be a lead generating tool. Social media is great, we can build amazing businesses through social media, BUT we should not rely on social media to sell our products/services. Your email list is where your followers are going to buy from. The function of your social media outlets (SnapChat, Instagram, Facebook Page, LinkedIn etc.) should be to roll your followers over onto your email list. A couple of months ago Instagram accidentally removed massive amounts of followers from some Instagram accounts with no notice. It was a glitch in their system! And more recently, Facebook recently removed a TON of non-engaged Facebook group members from groups, with no notice. And social media marketers lost their ever-loving minds over it! The fact of the matter here is that you do not own your social media accounts. Yes, they are important, ridiculously important, but there is something you absolutely need to realize here. YOU ARE AT THE MERCY OF THE SOCIAL MEDIA NETWORK AND THERE IS NOTHING YOU CAN DO ABOUT IT. So taking this idea into consideration, I need you to know that the main function of your social media accounts should be to get your audience on your email list. You own that list, and no one can take it away from you. So now back to today’s topic, Facebook Pages and Facebook Groups. What’s the point? What’s the difference? And how can we benefit from having both? Lets first unpack Facebook Pages. If you own a business you have to have a Facebook Page. There’s no getting around it. Back in the day, you used to be able to get tons of traffic to your Page, but that’s not the case anymore. As soon as Facebook realized that it’s users are willing to drop some serious cash through Facebook and Instagram Ads, the organic traffic that you used to be able to bank on through your Facebook Page vanished. Facebook now wants you to pay to play. Which brings me to my next point. If you want to run Facebook or Instagram Ads, then you NEED to have a Facebook Page. That’ how and where you’ll run your Ads through. And to be totally transparent here, I think you should always be running Ads. But I also think you don’t need to rely on Ads solely to grow your email list. The function of your Page should be to show a potential client what you do, who you are, and to get them to do something, like subscribe to a freebie and then get rolled over into an email nurture sequence and then an email sales sequence. But just know that unless something drastically changes, you’ll never get a ton of organic traffic to your Page. There are some strategies you can employ to get more eyes on your Page, but at the end of the day, that traffic is minimal and not long-lasting. Now how does your audience interact with your Page? Your audience can like your Page, and when they like your Page theoretically they see more of your content that you post. I think this isn’t the case as I have around 13,000 likes on my Page and approximately 80 people see the content that I post. For me, it doesn’t make sense for me to create content for my Page because of those numbers. I do not see a direct ROI from the content that I post on my Page. Those who interact with your Page through comments or likes, that information is public. So anyone who comes to that Page can see any comments or likes by anyone else. Now, let’s talk about your Facebook Group. Remember the old school AOL Chat Rooms? If you have a hard time wrapping your head around a Facebook Group, think about a Group similarly to how you used to interact in Facebook Groups. I think of Facebook Groups as a community banded around one cause. The topics can vary greatly from one group to the next, but the content shared inside the Group has a similar topic because of that unifying topic. One difference that a Facebook Group has is that it’s not up to the head of the Group to create the content. Group members have the opportunity to post, interact, and engage with one another in a bigger, more connection-based manner due to the fact that the Group is only filled with members who have a vested interest in this one topic. So when the Group is filled with the right people who want to engage and interact, the Group creator isn’t actually the one doing the heavy content creation, the Group members are. The Group creator’s role is to facilitate conversation, not to necessarily create content. Another difference is that you can’t run Ads to or from a Facebook Group. So there’s no “pay to play” aspect, like with your Facebook Page. And the beauty of this is that you can play to Facebook’s algorithm to get your Group more organically seen. This truly is where you can see the world’s largest social media network at play. The power of your Facebook Group lies within the platform of Facebook itself. The algorithm, while always changing, never demotes Groups. Facebook wants you to come to Facebook to create friendships, to reconnect with old relationships, to create new bonds with new people, and a great way to do that is through Facebook Groups! And the last difference that I want to highlight today is that because of the nature of Groups, your Group members are going to see the content shared inside of that Group a whole heck of a lot more than anything shared on your Page. Again, Facebook wants you to pay to play when it comes to your Page, but that rule doesn’t apply to your Group. Your Group members will get more notifications from your Group than they will anywhere else, which will keep them engaged, which will serve them in a bigger and better way, which creates loyal followers who fall in love with you and your brand. Before we wrap up, I want to leave you with today is that your Facebook Group can become a lead generation machine. You can leverage the power of Facebook’s algorithm to get more members into your Group organically, which also gives you the opportunity to offer up your freebie/opt-in/lead magnet to your group members, to serve them in a more holistic way because when you get them on your email list AND in your Facebook Group they are going to be getting such amazing value from you, almost daily! And that’s what you want. I am hosting a FREE 4-day Challenge called From Wallflowers to Groupies: the ULTIMATE Facebook Group Challenge where I’m going to walk you through how to turn your Group into a lead generation machine. Because as great as your group is, what it really needs to be is a mechanism that grows your email list, which in turn grows your business. If you want to get yourself signed up for this Challenge click here.